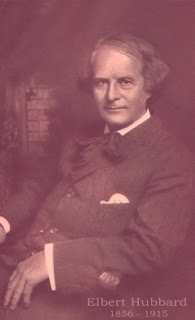 American author Elbert Hubbard once said: "Life is just one damned thing after another." Wow! Is life really so problematic? Well, that depends on your definition of the word ‘problem’. I define it as either the presence of something bad or the absence of something good. Problems, in this sense, are all around. People everywhere experience lots of difficulties and unfulfilled desires. But that is not only bad. Of course, problems are unpleasant but they have a positive side too. The useful thing about them is that they help you take action. Problems can be so unpleasant that they motivate you to change your situation. Changing the situation helps to get rid of the hurt of the problem. Thus, problems generate a desire and energy for change. Helping people to clarify what causes the desire for change is often a very useful first step. Acknowledging problems by clarifying how they are a problem and to whom they are a problem can be an important key to clarifying the need or the desire for change. 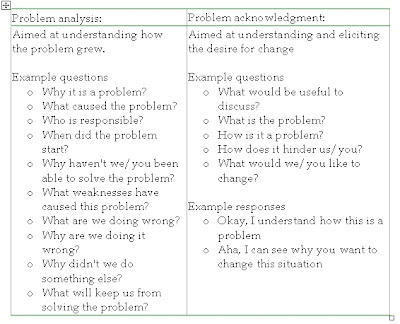 The table below shows some key differences between problem acknowledgment and problem analysis. Cooperatively, the solution-focused practitioner and the client explore the client’s frame of reference and perception of the situation. Important is that the clients definition of the problem is accepted. As a consultant or coach you respect the perceptions of the client. Solution-focused consultants acknowledge the right of clients to choose their own values and beliefs. Insoo Kim Berg said, when I interviewed her: “We value what the client brings to the situation and work with that. Of course you can't totally leave your ideas behind you. And you don't have to. It is like you have one foot in the client’s world and the other in your own. And if a client says something like 'My boss is a lunatic', I work with that but don't have to agree with it. I don't care if the boss is a lunatic or not. I don't have an opinion about that (In: Visser, 2004). Also, you use the language of your client. When asking questions, paraphrasing or summarizing you preferably use the exact same key words and phrases the client uses. Experiences or views of the consultant do not play a role and are not mentioned. In solution-focused change it is not necessary to get a complete understanding of why something is a problem and which factors contribute to the problem. Detailed knowledge about the problem and the circumstances in which it happens is not necessary. In fact, it is surprising how brief the talking about the problem can be even when there is a very serious problem. The reason that talking about serious problems often can be brief is that the goal is to clarify the desire for change. What is it that the person wants to be different? Once this is clear to the client, there is no further need to explore the problem. However, brevity cannot always be accomplished. When a client finds it necessary to talk more about a problem, the solution-focused consultant will allow him to do so. At the same time, the solution-focused practitioner is constantly intervening to bring the conversation one step further, in the direction of outcomes desired. Instead of asking for more details about the problem, he will constantly try to bring the client to start specifying how he would like things to be or to describe when things were better. The solution-focused practitioner will never force the client to move on, however. He will pay close attention to whether the client mandates him to proceed. A mandate may be a verbal or a nonverbal sign by the client, which signals that it is okay to proceed to the next step. For instance, if the consultant has summarized how something is a problem, the client may say: “Exactly, that is it!” That is a clear mandate signaling that it is all right to move on to “How would you like things to be different?” In solution-focused change, this way of working is called leading from behind (Cantwell & Holmes, 1994). By asking very specific questions the manager or coach is absolutely leading but he stays always one step behind the person he is leading by never confronting or hurrying him or her. I think using the client's language is so important. When I was a public school teacher, I learned that using a student's language is important as the way they express themselves is more understood by their peers. So I tried not to rephrase what students said. Often I tried to get students to listen to each other too. The challenge here is that I think people feel the need to say something different. Fortunately, there is no need to say anything new or different to help someone. The more I have thought about language matching the more I have come to the view that it makes the other person feel understand which opens him or her to listen to your view.